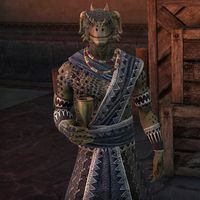 Drops-No-Glass is an Argonian Achievement furnisher who can be found at the Vivec City Furnishing in the Canton of St. Delyn the Wise in Vivec City. "A reputation clings to a person like mud clings to a boot. Always make sure yours is a good one." "Ah, yes, I've think I've heard of you. My memory is hazy, but my deals are clear as spring water." (Vvardenfell) All 36 Sermons, individually bound for use in personal libraries and family shrines. This page was last modified on 15 March 2018, at 02:56.